Convert to Christianity; lived at Florence in the middle of the sixteenth century. He was a native of France and was originally called "Todros Cohen." As the physician of a Spanish duke, he was with the imperial troops who besieged Florence in 1530. Later, at the age of fifty, he embraced Christianity at Genoa. 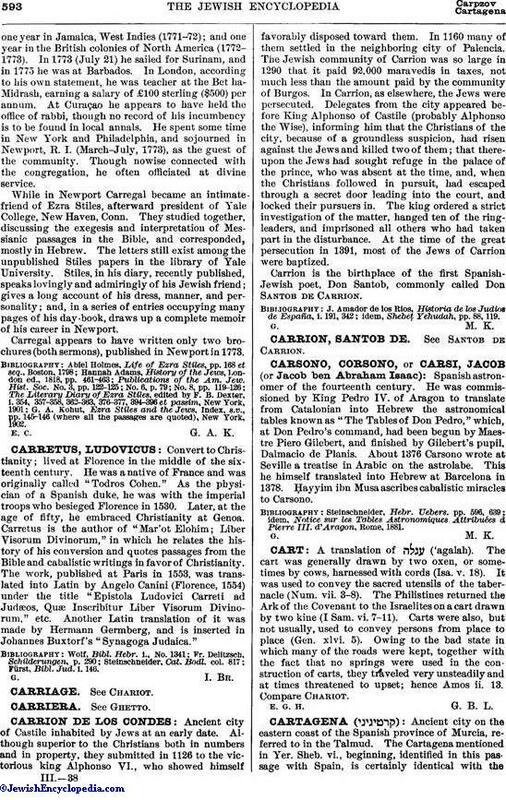 Carretus is the author of "Mar'ot Elohim; Liber Visorum Divinorum," in which he relates the history of his conversion and quotes passages from the Bible and cabalistic writings in favor of Christianity. The work, published at Paris in 1553, was translated into Latin by Angelo Canini (Florence, 1554) under the title "Epistola Ludovici Carreti ad Judæos, Quæ Inscribitur Liber Visorum Divinorum," etc. Another Latin translation of it was made by Hermann Germberg, and is inserted in Johannes Buxtorf's "Synagoga Judaica." Fürst, Bibl. Jud. i. 146.